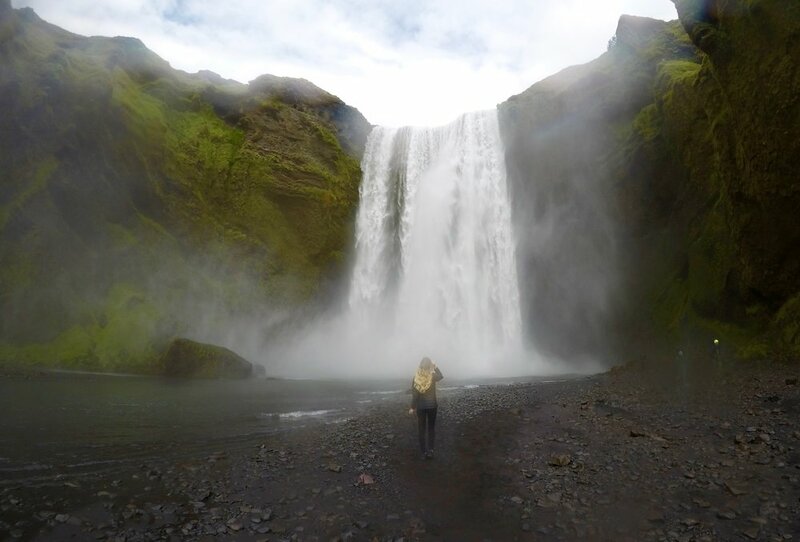 When you think of Iceland, you think of a very cold and icy place, right? When I told people I was going to Iceland, they would look at me as if I had said I was going to Antarctica. They would tell me to pack my thermals and to take a parka as if I would be sleeping in an igloo. Iceland is called “the land of fire and ice” due to the volcanic rock formations and the deep glacier valleys. So yes, there is ice in Iceland, large glaciers in fact, but it is not freezing cold year-round. That said, it is still wise to pack a coat (ideally waterproof), an umbrella, and a wool hat. There will also be days when a light sweater and sunglasses will be your go to wardrobe. 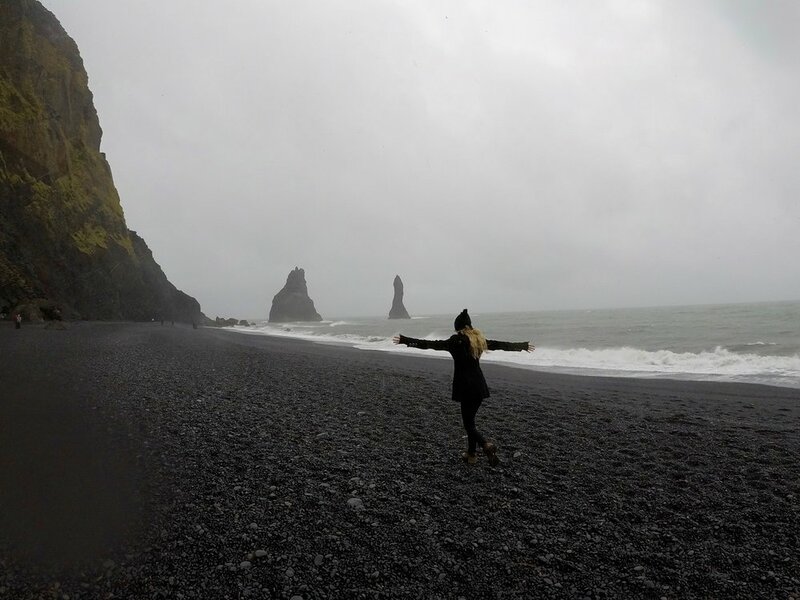 (I will cover tips in the next section as the weather in Iceland varies from place to place. 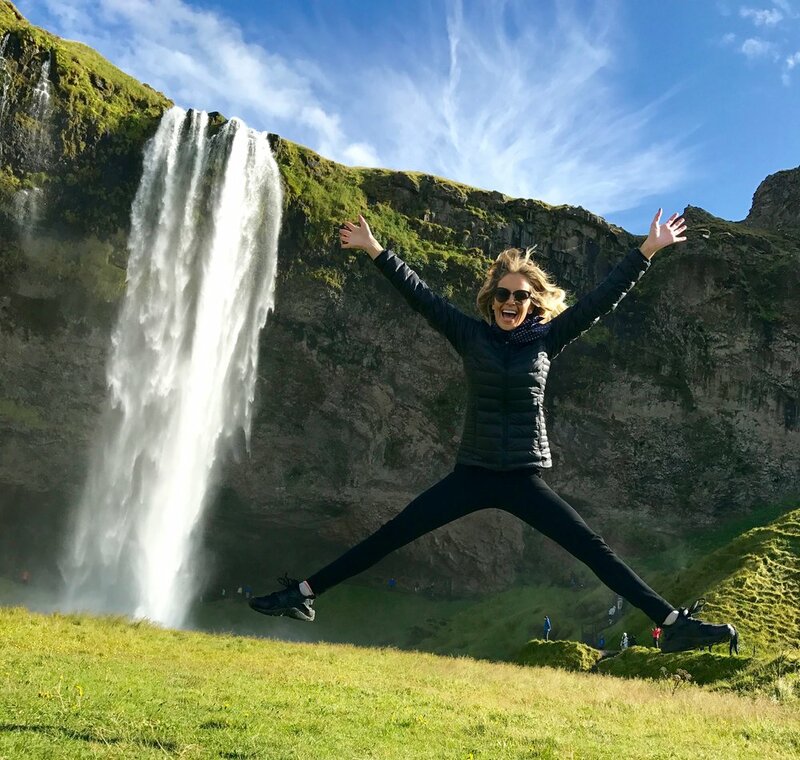 I have wanted to go to Iceland for years ever since I saw photos of the Northern Lights, the cute Icelandic ponies, the volcanic rock fields that resemble what the moon might look like, and the amazing waterfalls and rock formations off the coasts. Iceland seemed to be one of the most beautiful and romantic places in the world to me, and upon going there, what only seemed to be, proved to be absolutely true. I flew WOWAIR from LAX to KEF (Keflavik International), the main airport in Iceland. I got my one-way ticket for around 230 USD, very cheap. WOWAIR is a very basic budget airline. You must pay an additional fee to have a carry-on, luggage, and food. They don’t provide any entertainment, nor do they have blankets or pillows, so you must bring you own. I brought a small travel pillow and blanket I got off a past flight. I would dress warmly on the flight as flights always seem to be freezing. I purchased water and snacks in the airport prior to departure and had a fine flight. I slept the entire way. All in all, I would fly WOWAIR again if the price was as low as the price I paid for this flight, just be advised that for every kilo you go over the baggage weight limit, you pay an extra fee per kilo which could quickly become costly. Upon arrival, I was able to fly through customs and get my bags quickly as the airport isn’t huge. I took the rental shuttle outside the airport which was easy to find and went straight to BLUE CAR RENTAL where I was greeted and helped. The man who checked me in my car was lovely and so helpful. 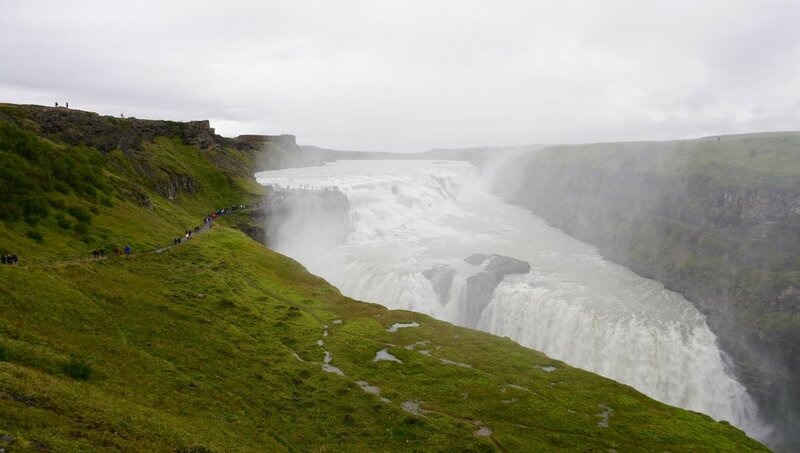 He gave me driving tips for Iceland, told me some of the must-see sites, and advised me of which roads to avoid and other warnings, like being cautious of the strong wind gusts when opening the car. I was really happy with the staff there and appreciated that the rental insurance was included in the price, as many other carriers make you purchase insurance separately on top of the day rate. BLUE CAR RENTAL is a family owned local business which I like because they truly value you as a customer. I feel like the detail in customer service is always better in local businesses than in a chain company. I, certainly felt this way with BLUE CAR RENTAL. 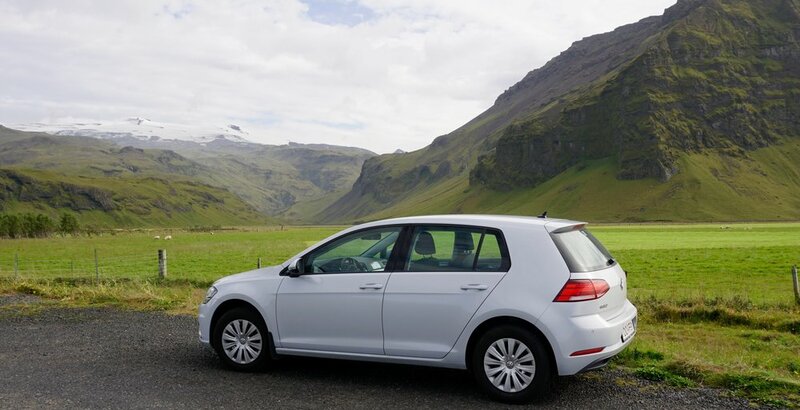 I got a cute little silver VW Golf automatic, and* beep beep*, I was on my way to my first hotel in Grindavik, 20 minutes from the airport and 10 minutes from the Blue Lagoon. 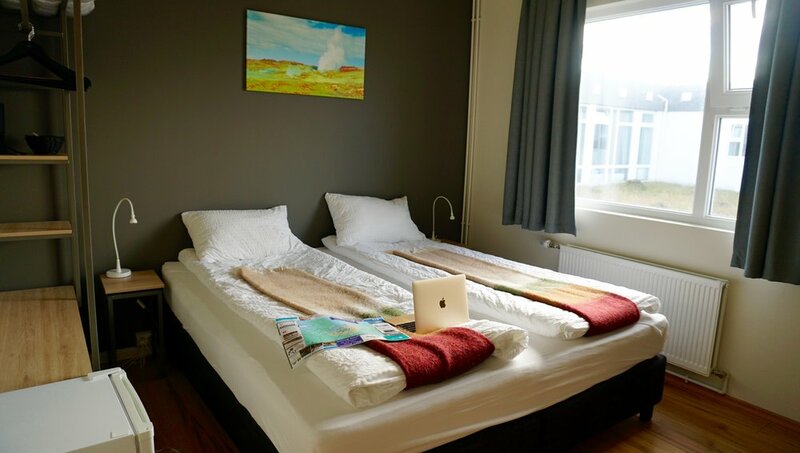 My first hotel was GEO HOTEL GRINDAVIK. It was a cute little hotel in the small town of Grindavik with everything one might need. The staff was great and the hotel had a lovely communal area where I worked on my blog. It is also super clean which is important to me when I stay places. And as I mentioned before, Grindavik is only 10 minutes from the Blue Lagoon, so it felt like a no brainer to stay here since I wanted to get the 8 am time slot to get to the lagoon the next morning. 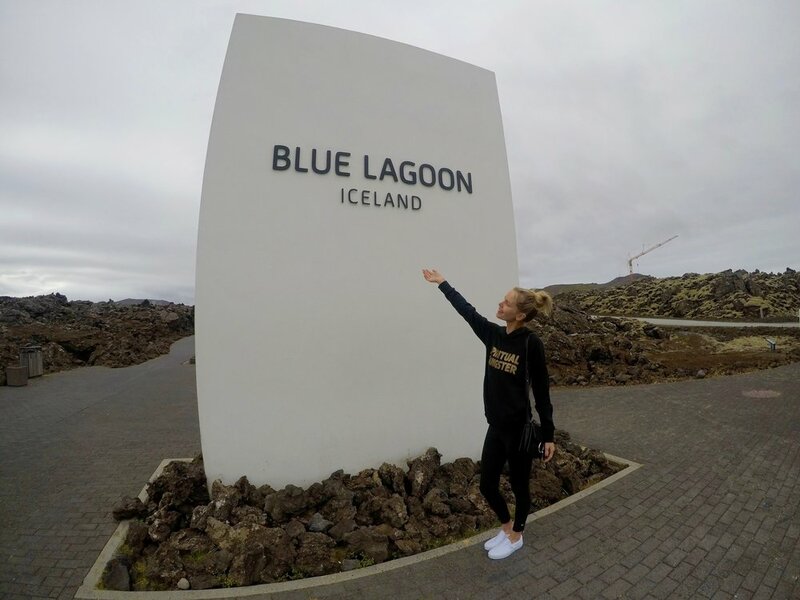 I always like to get to touristy places early to enjoy the calmness and to get the best photos before it gets too crowded which was exactly what I did with the BLUE LAGOON. I was one of the first people there! I purchased a package that included a towel, a silica mask, and a free drink. If you are on a budget, I suggest just bringing your own towel and flip flops and you’ll be fine. Also, make sure to have a waterproof camera or case for your camera or phone. The lagoon is amazing. It’s so warm and big, and you can put on a white clay mud mask and float around in the warm water. I think if you’re in Iceland, you really shouldn’t miss it. After the Blue Lagoon, I made my way southeast to HOTEL RANGA, a log cabin themed hotel in the middle of nowhere. This was a great place to stay for seeing the Northern Lights. The entire hotel looked so cool and it had loads of amazing photo opp. spots. There is a restaurant in the hotel with amazing food and lovely staff members and multiple jacuzzis outside in which you can relax in and star gaze at night. It’s quite romantic. The rooms were very large, and again I loved the whole wilderness log cabin vibe. 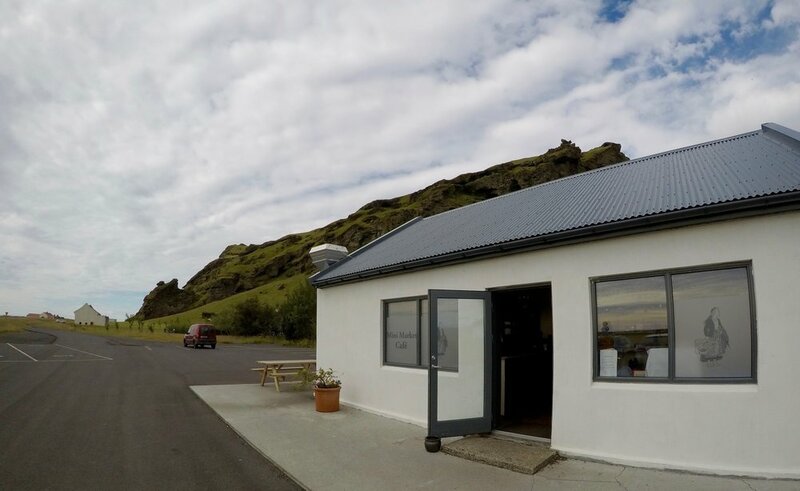 I would highly recommend this hotel especially if you plan on doing the Southern Iceland tour as HOTEL RANGA is right by the start of the tour with the first waterfall called “Seljalandsfoss” being only twenty minutes away. 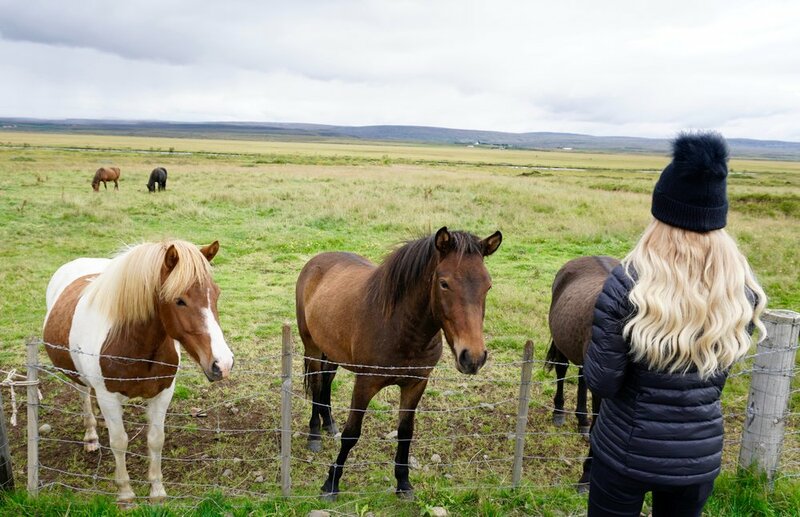 There are also a lot of Icelandic horses on the roads between Grindavik and Vik that allow you to stop and take pictures with them. There is a little café called Mini Market Café which is great for a small lunch, to grab water and snacks, and to use the restroom. There is a troll house just beside it and horses close as well. 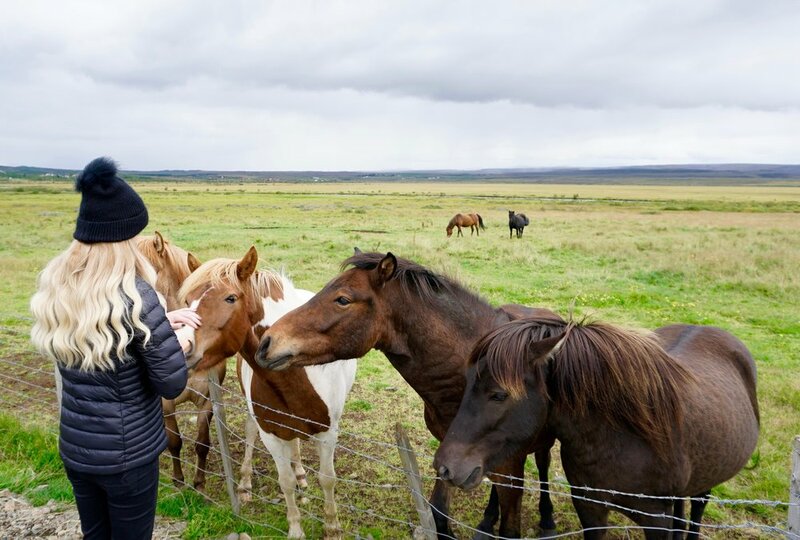 There are also horses all along the Golden Circle as well if you want to get your horse fix. Just make sure to have treats for the horses or they won’t even notice you’re there! Did I Mention the Horses? 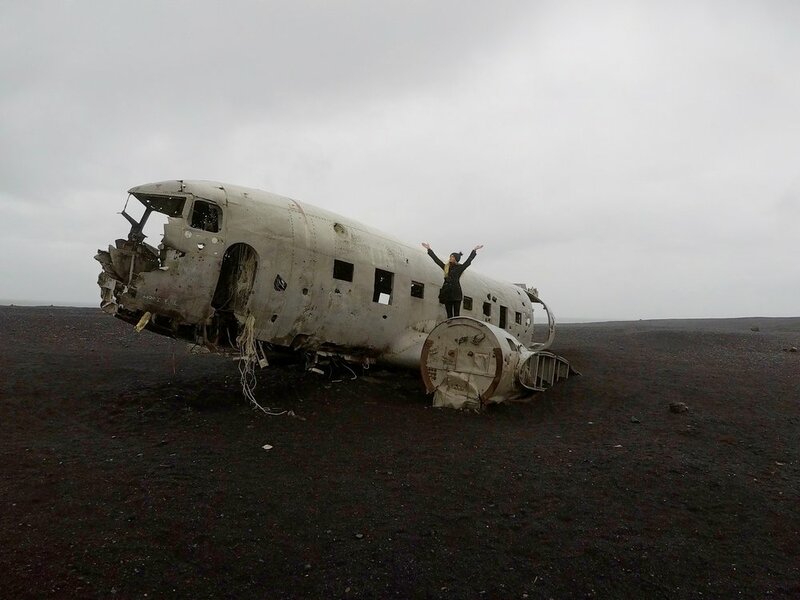 I did the Southern tour on my third day, making it all the way to Vik and to Black Sand Beach which is stunning. On the way to Vik, you will see two amazing waterfalls called Seljalandsfoss and Skogafoss, along with some troll houses, 50 percent of Icelandic people believe in trolls and elves, how cute, a secret pool called Seljavallalaug, you have to follow the GPS and then park and hike about 20 minutes, but the view is one of the most amazing views in Iceland and the walk is really easy and so worth it. 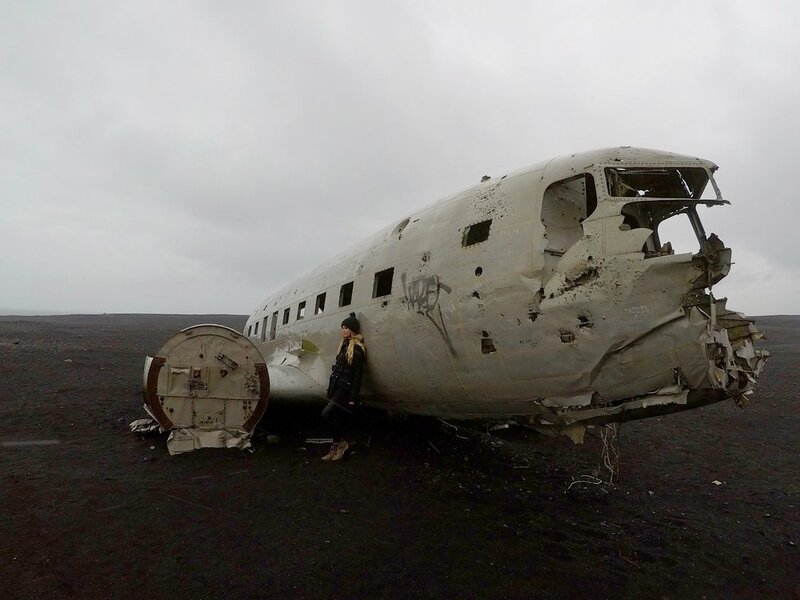 Bring a change of clothes and a swimsuit obviously, a huge glacier, a plane crash site called DC-4 this is a long walk to the crash site, about 4 miles RT. There are about 165 markers on the way, so count them if you want to know how close you are. Also, dress warm and wear good shoes. 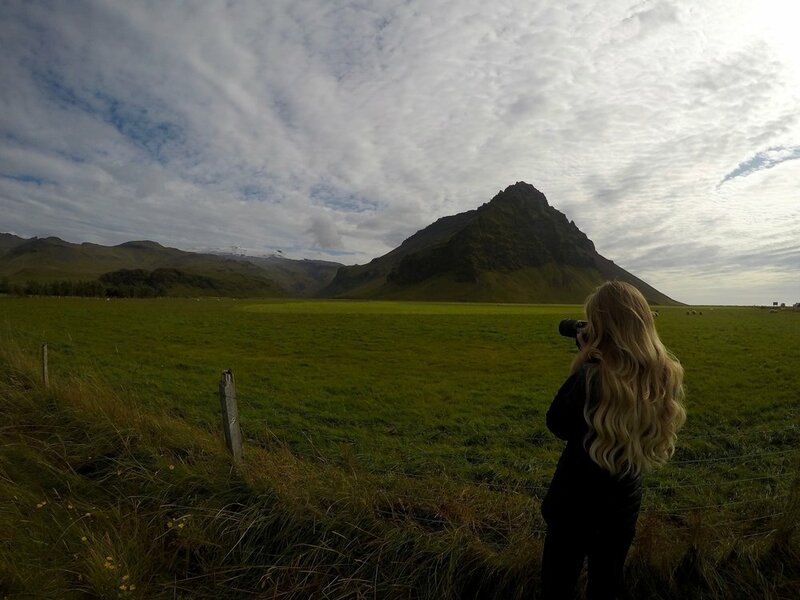 You will truly see so many stunning things on your drives throughout Iceland. I wanted to pull over every 10 minutes for something else. If you have the same urge as I did, make sure to not pull over on the side of the road as this is not only dangerous but illegal as well. Alternatively, there are many little inlets you can pull into that are much safer since the roads in Iceland are very narrow and only have two lanes. 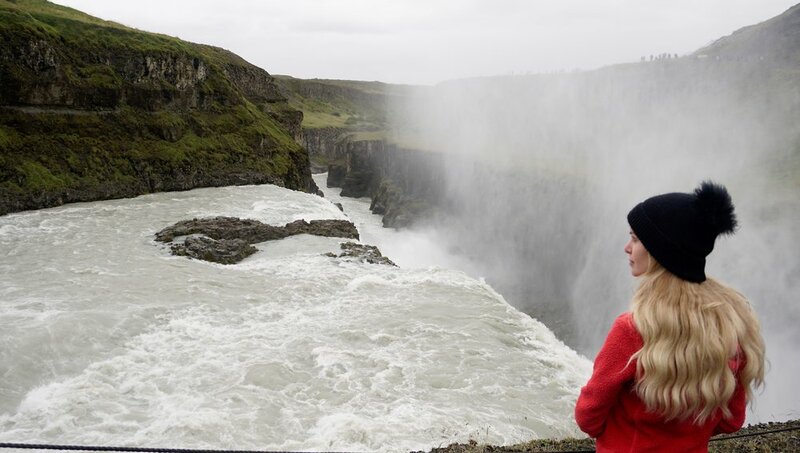 The next day, I went and drove the Golden Circle which began with Kerid, a volcanic crater over 3,000 years old, then a geyser called Geysir, which in my opinion was kind of lame, but it’s right next to the Gullfoss Waterfall was the best waterfall I saw in Iceland and a must see. 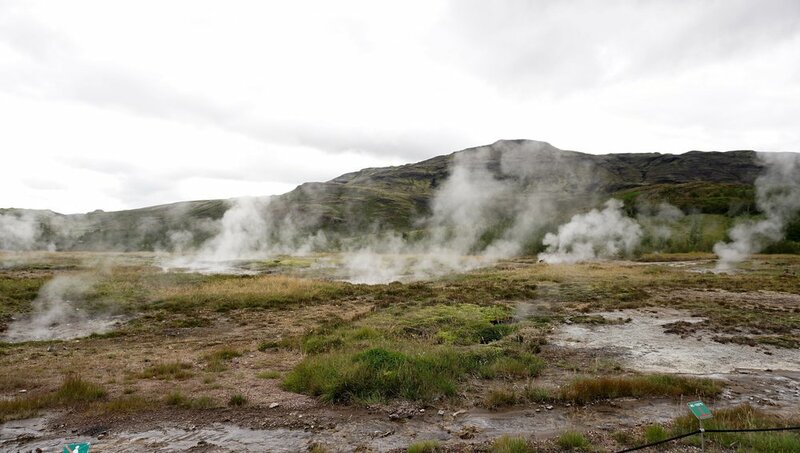 So, why not stop by Geysir since you’ll be passing it anyway. The photos you can get in this stunning country are endless. I think I took over 900 photos in 6 days. It truly is one of the most amazing countries I’ve been to. There are so many vast landscapes such as this lava rock that looks like you’re on the moon and the moss covered stone. In some parts of Iceland, it truly looks like you are on another planet. It’s no wonder that sci-fi movies are shot here as the terrain looks so foreign. It’s like nothing I’ve ever seen before. I cannot stress how beautiful it is. Even the photos I took do not do it justice at all. I loved having my BLUE RENTAL CAR as I could zoom around all the tourist destinations and not have to pay for the tours, which in my opinion are kind of a waste of money. You can do it faster and cheaper by renting a car and doing it yourself. If you would like to book with BLUE CAR RENTALS to get a 5% discount, it is best if you go to their website and create your booking there. When you get to the personal information page, there is a coupon code box where you can insert the code #BLUE_OMM for the 5% discount. I highly recommend them! 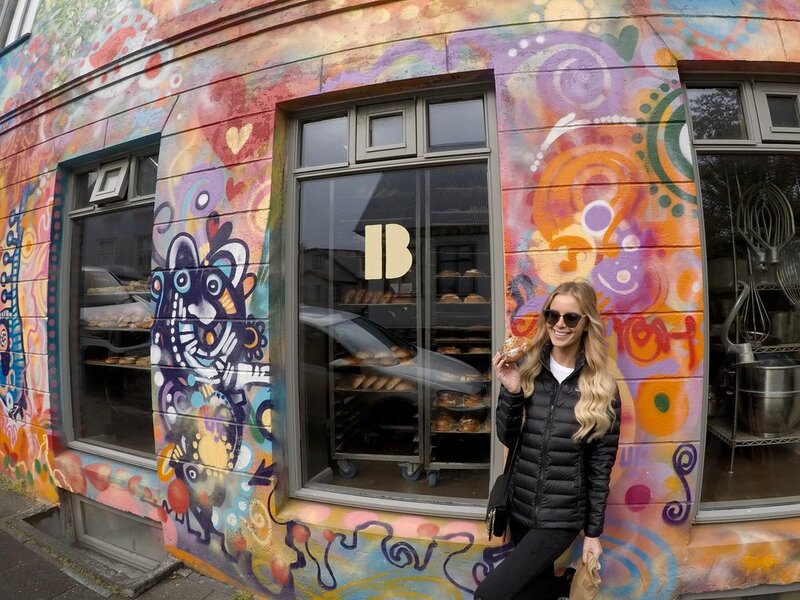 I spent my last day in Iceland to discover Reykjavik, the capital. It’s a lovely little town with a lot of charm. There are a lot of cute shops but be prepared to spend as it’s quite expensive. Clothing, food, etc. is costly so be mindful. There is a great sweet shop called Vinberid you should stop at for a treat. I had the best pancakes and dessert at Sandholt, and you must head to Braud and Co, for their cinnamon rolls. It’s the best I’ve ever had. For dinner, I ate at Sushi Social which was amazing and had Italian at Jamie’s Kitchen which is a chain, but I still loved it. 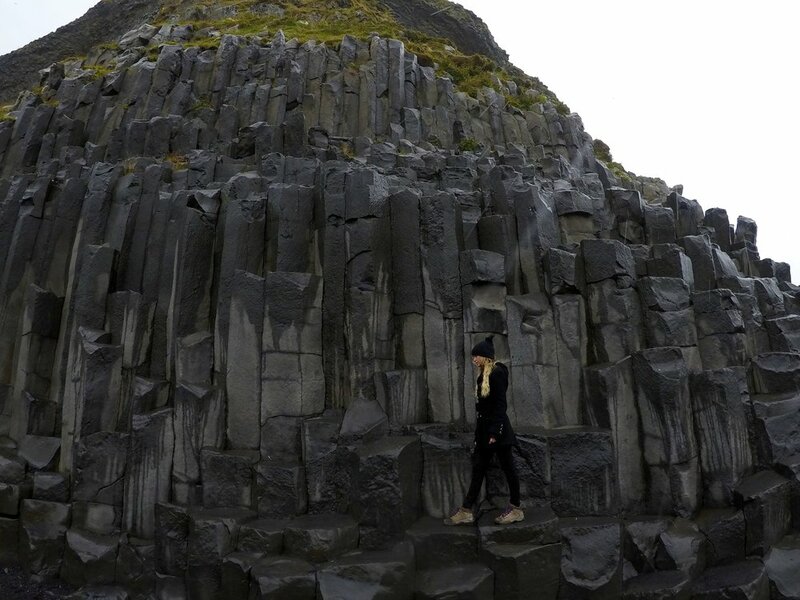 You must see Hallgrimskirkja Church in Reykjavik as it’s such a cool piece of architecture and the building was inspired by the stones at the Black Sand Beach near Vik. You also should go see the Sun Voyager Statue right on the water which was cool and had lovely views of the sea. I stayed in Reykjavik two nights at ICELANDIC APARTMENTS which were lovely but honestly, I wouldn’t stay in Reykjavik if I were to go back. 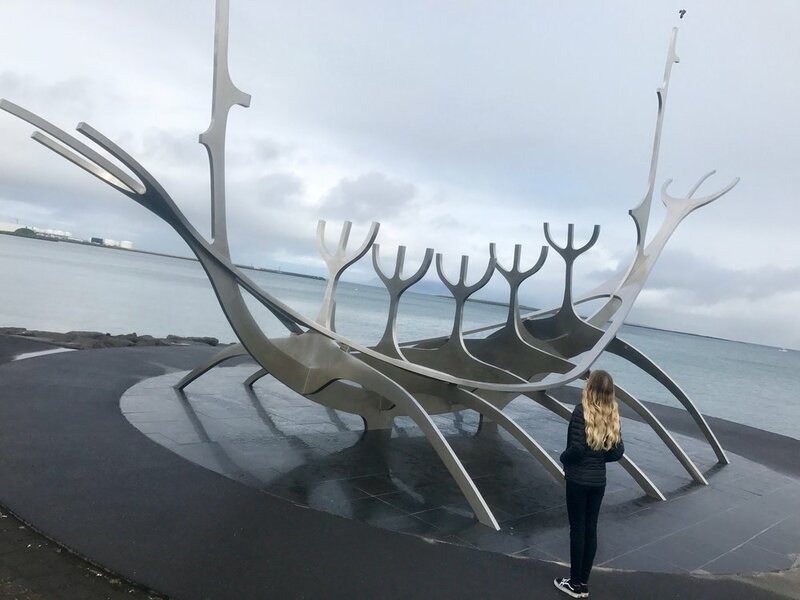 It only takes half a day to explore Reykjavik, so I would either stay in the South or the Northwest as the beauty truly is in the country sides and the coasts. I really wanted to make my way to the Northwest and to the peninsulas up there, but I had no time. I will definitely come back to do that side of Iceland next time. 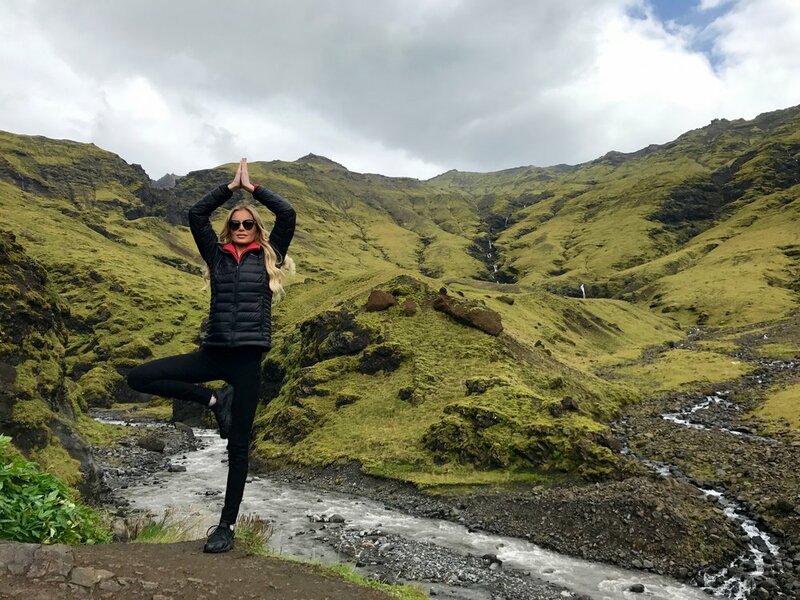 I have traveled to 35 countries and Iceland truly stole my heart and shot to the top of my “most beautiful places I’ve been to” list. It really should be on your list too. The scenery, the horses, the thermal hot springs and pools, and the coasts will take your breath away and leave you wanting more. I will be back, and next time, I will make sure to go when the Northern Lights are visible! If you’re looking for a vacation with a little bit of everything, then I would book your flight to Iceland. It truly is out of this world! 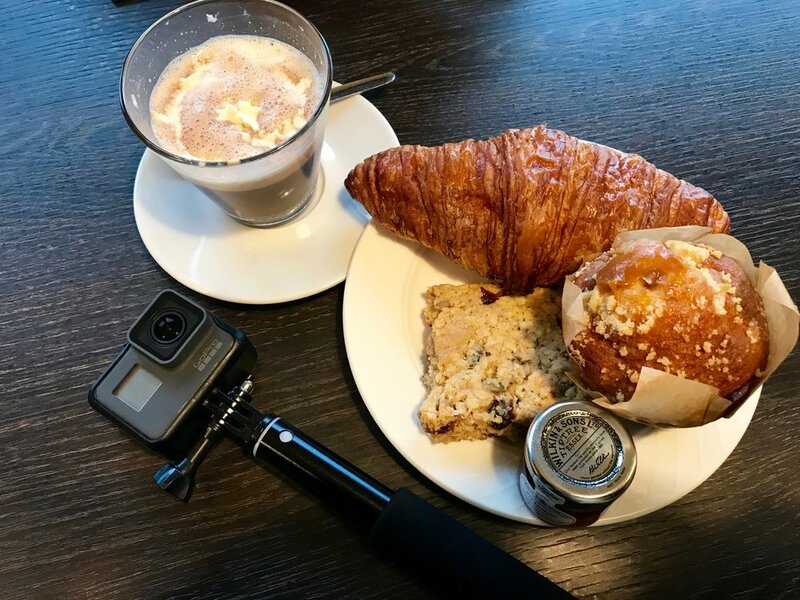 Below are some Iceland Travel Tips and info! 1. Bring a water bottle and refill it from the tap to save. Many Icelanders will think you’re crazy if you waste money on bottled water. The water here smells like rotten eggs but is truly the best water in the world to drink and to bath in. Don’t be alarmed by the smell, it will make your skin super soft. 2. Don’t drink alcohol here. It’s heavily taxed, and as if Iceland isn’t expensive enough, your beer or martini will be double to triple what you would normally pay. 3. If you are trying to save money, I would rent a car as opposed to paying for taxis and site seeing tours. The roads here are easy to drive on and there is one main Ring Road. You can then go to places on your own time. I rented from BLUE CAR RENTAL and I had a great experience. Remember, DO NOT pull over on the side of the road unless there is a driveway or inlet as it’s illegal and very dangerous. 4. If you want to get cute photos with the horses, have treats such as plain (not chocolate) biscuits with you. Otherwise, they will just ignore you and not make their way over to you. 5. Bring something waterproof. There is a lot of rain in Iceland. Sometimes it doesn’t last long, but other times it can suddenly start down-pouring. If it isn’t raining in one area, it could be down-pouring 10 miles ahead. The weather and climate change very quickly in Iceland. I recommend wearing layers, so at least if you get warm, you can take them off and leave them in your rental car. 6. Bring a change of clothes on your site seeing tours just in case you get wet. 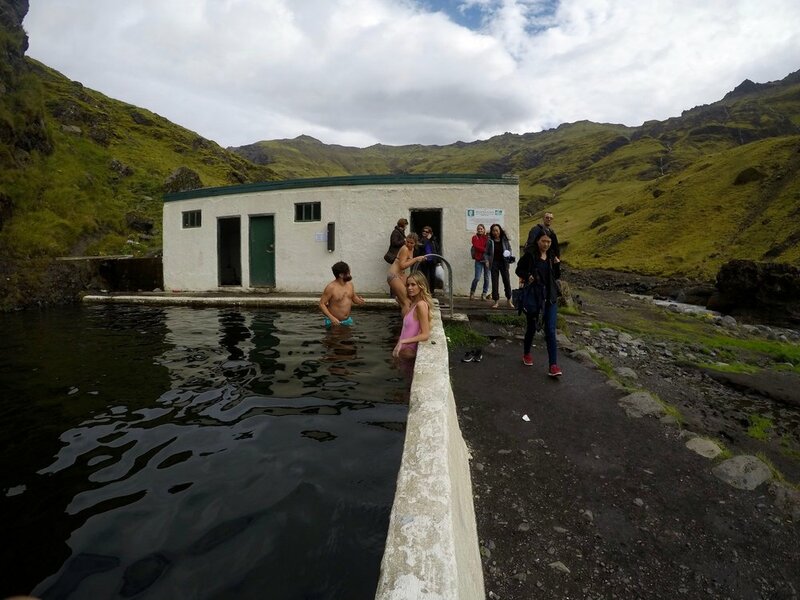 Also, bring a swimsuit as there are all kinds of hot springs and cute secret pools (Check out Seljavallalaug). 8. Go to The Blue Lagoon and bring your own flip flops and towel to save money. Also get there early to beat the crowds. Get in the lagoon from the left where you can get down inside the hot water and go through the cave to avoid walking in the cold to get in. Girls: Keep your hair dry. The water there makes it super dry and frizzy. ALSO! You must PREBOOK as there are time slots for people, and if you miss your time slot you’re out of luck. 9. If you can, depending on where you are staying, go to the market and cook your own meals or buy snacks at the grocery stores if possible. The food there is truly a huge expense, even a burger and fries pushes 25 USD. 10. Tipping here is not required but appreciated. You can use a credit card almost everywhere. Make sure you know your pin if you have a chip and pin credit card. 11. Fill up on gas if you get low as sometimes you will drive two hours with no gas station in sight. Also, use the restrooms in gas stations as there won’t be public restrooms for miles unless you want to squat outside. 12. If you want to see the Northern Lights make sure you go in the late fall and winter as you won’t see them in the summer. You do however have the midnight sun in the summer meaning that you have very long days to fit in a lot of site seeing. Bring some sleeping aids though so your body knows when to go to sleep. 13. If you go to Vik, stay away from the water as it can be very dangerous. There are strong undercurrents that have taken people out to sea. 14. Bring extra camera batteries or make sure they are fully charged when you leave. I also brought a car cell phone charger, so I would never have to worry about a dead phone. 15. Don’t stress about the language as almost everyone speaks English, so you will not have a problem. Have fun, be safe (Iceland is one of the safest countries in the world with little crime). Enjoy this beautiful country! Check Out Some More Photos! Disclaimer: I do not edit photos except for cropping. I like to show the reality of people and places as today photos and lives are far to organized, polished, and enhanced. Iceland is a place that needs no photoshop!